Mysuru : Creating a security scare, a man managed to come right next to prime minister Narendra Modi's car near VV circle in Mysuru on Saturday late evening. The man carrying a bag ran parallel to Modi's convoy here before being taken into custody. As people lined up on both sides of the road, the man chanted "Modi, Modi" and came close to the motorcade when the Prime Minister was proceeding to Lalith Mahal Hotel, where he is staying overnight. The incident happened near V V circle after Modi attended the birth centenary celebrations of Shivarathri Rajendra Mhaswamiji of Sri Suttur Math, according to police. DGP Om Prakash said in Bengalur, "A person, who was shouting Modi-Modi, was seen running? parallel to the convoy of the Prime Minister. The local police have taken the man into custody and are inquiring,"
Asked how serious the incident was as the person was carrying a bag, he said, "The Mysuru Police Commissioner is scrutinizing the footage, and if there is any suspicion on the person's part, action would be taken. "Asked about the content in the bag, he said "If there is something, local police will get in touch with me. For now, there is no such update from their side." 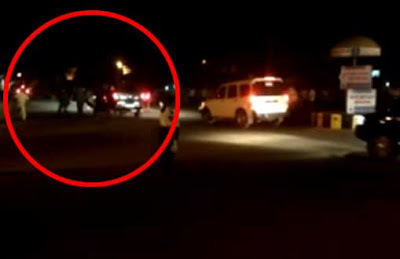 In the sketchy footage of the incident caught on mobile camera and beamed by some TV channels, it appeared as if the man waiting on the road for the convoy came close to it, even as others stood on the footpaths. As the word spread about the incident, activists of a group named "Modi Brigade" staged protests demanding action for the alleged security lapse. Modi is on a two-day visit to Karnataka, as part of which he covered two engagements in Mysuru today. He will inaugurate the Indian Science Congress here tomorrow. After the incident, local BJP party workers staged a protest demanding the resignation of Mysuru city police commissioner Dayanand. The police are going through CCTV footage to ascertain more information about the youth. However, the youth was not carrying any weapons and appeared more to be a bhakt. Top brass of the state police has ordered a high-level enquiry into the incident and in all probability few police officials will have to face suspension.